I'm obsessive about lists. Love the things. I have a daily to-do list and a monthly, one that extends out for the rest of the year, one for my gardening, one for my book business, one for my personal stuff, one that combines garden/book/personal. To-do lists keep me on track with my goals & dreams. And I love, love, love crossing off items as I complete them. "What a feeling/Bein's Believin'...Take Your Passion/And Make it Happen" ~ Flashdance - What a Feeling! How about you? Are you a to-doer or not a to-doer? I live by lists. A friend just let me know recently that she has online lists with columns! I want that! List addict here, too. I don't know how to function without them! 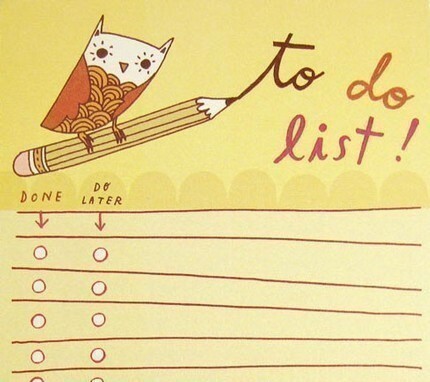 I have my daily to-do list, but going farther than that is beyond me! I even use the electronic TeuxDeux.com daily organiser. It's completely changed my life. What timing! I am making a big to do list today! I do love lists too. Love crossing stuff off. And I love that song from Flashdance too! :) Have a great day and enjoy your lists. When I finish something that's not on my "to do" list, I add it to the list just so I can enjoy crossing it off. LOL! Lived by lists until I needed lists of my lists. May take up again but, for now, if it doesn't fit in my cell phone calendar, probably not going to get done. I love lists. I make lists of my lists. Then I cross things off the sublist until that's done, and I can cross the big item from the main list and man-o-man don't I feel accomplished! Off to work on an online list w/ columns, and check into a TeuxDeux organizer, and SUBLISTS!...cool! I'm a list-maker too, but they have to be on real paper, since I'm somewhat of a Luddite! I have my list on post-it notes and for grocery shopping I type in on the computer, print it out and always leave it in the printer. I have lists at work, at home, and they tend to criss-cross and I try to get them done. I have lists on my computer, using a great app called Wunderlist. I love lists! I have lists for everything: a list for my (day) work projects, a list for my (writing) work projects, and a list for my personal life projects. Everything nicely divided and planned out. My only problem? I keep losing my lists! I love lists too but occasionally somethng turns up on one that I've scribbled the night before and can't decipher the next day. Yesterday it was what looked like "Donbin." I finally figured out at 3:00 a.m. that it was "Domain" and I wanted to call about my web page. I never used lists until recently. The older I get the more I need them, and even then I forget some things at the grocery store. I also lose lists - never used to lose anything. They do help though for all aspects of my busy life. I only make a list when I am leaving for holiday. What to pack, what to do in the house before I leave. And only very sometimes a grocery list.